Being Adelaide CBD workers, we are always on the lookout for somewhere new to grab lunch. Sprinkling in the new with our regular lunch haunts, gives our work week an extra pep in it's step! So when The Meat & Cheese Club​ invited us to try a few of their menu items, we were excited to see what they had to offer. All food was provided on behalf of The Meat and Cheese Club. In a blink and you'll miss it location on Grenfell Street, they have breakfast, lunch, snacks and coffee covered. A small bar style table inside and a couple of footpath tables outside, it's probably best suited to a worker or passerby happy to grab something on the run. Meat and Cheese Club owner, Damian Vasilevski, has a big focus on local produce, using local South Australian smallgoods, produce and coffee roasters where possible. We tried a toasted sandwich using Barossa Fine Foods​ smallgoods within a freshly baked pumpkin seed sourdough bread - yum! The balance of flavours here was spot on. Meat and cheese, a fresh and punchy salad and delicious (locally baked) sourdough to bring it all together. A delicious, top quality lunch suited to someone who wants a lunch that they'd be happy to put together themselves at home, but quick and fresh at work! The soup of the day was a tomato and lentil, which for $6.50 was a bargain. It was packed with tomato flavour with lots of tasty lentils for some textural interest. Served with some crusty bread to mop it all up, it was tasty but a bit too oily for us on this occasion. 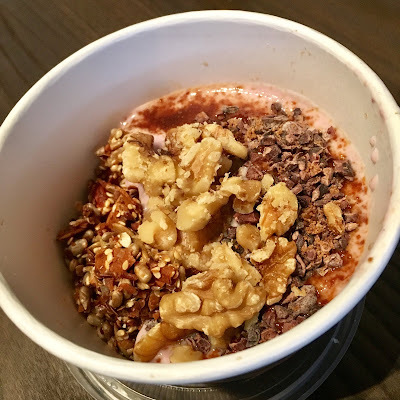 We also tried the house made organic mixed nut granola with B.-d. Farm Paris Creek​ yoghurt, honey, cocoa nibs and coconut. As a quick, on the go breakfast, it was enjoyable with great crunchy textures, perfect also for a healthy mid-morning snack. Many of the elements here were house made, so this one is likely to change depending on what is available and in season. We finished with tasting the house made tarts, the pecan and the lemon and honey. Both beautifully baked, with a pastry that melted in the mouth and the subtle elegance of the honey in the lemon tart was a great addition! The pecan tarts's caramel was gooey and the crunch from the walnuts was a great combination of textures and flavours. Everything we tried on the menu today was under $10, which we think is a great value CBD lunch, that makes returning to The Meat and Cheese Club very attractive. And, with locally sourced ingredients the priority, it's a great way to continue to support our local South Australian economy. We look forward to trying something in their title next time, as the meat and cheese packs look great to mix up the soup and sandwich lunch routine... or even better for the Friday night knock off drinks in the office!